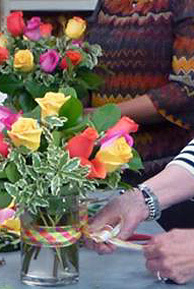 Learn to arrange roses like a pro! June is Rose Month. Let's make the most of those beautiful flower bouquets! Class is held Saturday afternoon, June 15 from 2:00-3:30pm at Viviano Flower Shop, 32050 Harper Ave., St. Clair Shores, MI 48082. Please arrive early for registration completion if not already paid in full. Workshop fee: $50, payable in full; or reserve your place with a $10 deposit and pay the $40 remainder upon arrival. Hands-on guidance and all materials are provided.